Wow Stella I really love the flavour combinations you have selected here and what a unique way to enjoy asparagus. I only wish it wasn’t so expensive for you to buy where I live in Bahrain. Thank you Cheryl! I like to put fruits in my salads: strawberries, peaches, pears, etc, love how one bite has a combination of both sweet and salty 🙂 Try it, I hope you’ll like it! Hi Fox, glad to have swayed you to the “dark” side lol 😉 But trust me, this combination is so worth it! Let me know how you liked it if you got around to making it. This really looks great. I would have never thought to put strawberries and asparagus together. A must try it! A very intriguing combo here. Love it! Looks beautiful and sounds delicious! Thank you Jenn, it did taste delicious. Beautiful! 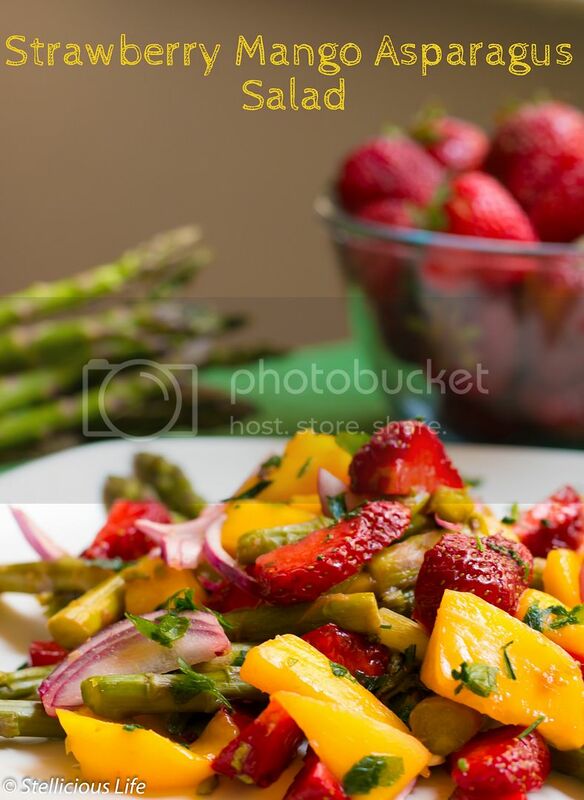 And I bet the savory asparagus is delicious with sweet strawberries and mango. It was Becky, and I just love it when a dish is so colourful! Well this looks divine! I love asparagus. and strawberries. and mango. Then you should definitely try mixing them for this salad Tracey! I completely agree Howie, green asparagus tastes somehow more “fresh”. That’s why I also used it for this recipe. Wish we had asparagus and strawberries in season and make your salad… But I can tell you one thing… I really like your dressing suggestion and especially the fact that you used orange juice. It sounds fruity and healthy at the same time. Thank you. Yes, it tasted so fresh, fruity and summery, that I made a note to myself to use fruit juice in salad dressings more often as it tastes divine. Wish we had asparagus and strawberries in season and make your salad. But I can tell you one thing… I really like your dressing suggestion and especially the fact that you used orange juice. It sounds fruity and healthy at the same time. I would have never thought of this combination! It sounds like a delicious side dish or late spring salad when the asparagus is at its peak. Interesting combination! Never paired asparagus with fruit before. Will have to try it! mmm! these are all some of my favorite foods – mango with strawberries is always the best combination. Perfect for BBQs! Yay, a kindred spirit! 🙂 And yes, it is perfect for BBqs and any grilled vegetable or meat. Don’t feel like you need to continue the chain you don’t want to, but at any rate I think you have a great blog! That salad is gorgeous! 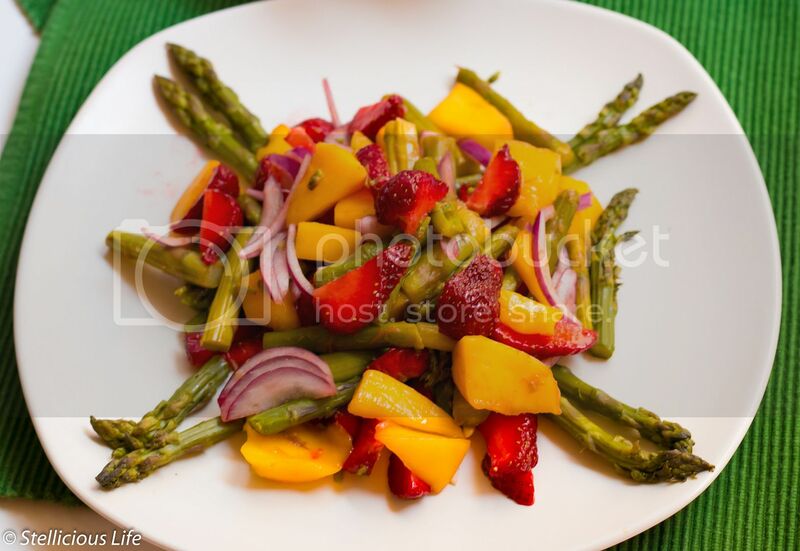 I loooove the strawberry mango combo and I love the asparagus in this. I find that I run out of things to do with asparagus so this is perfect! Thank you Sarah! Yes, I love fruity salads and the combination of sweet mango and juicy strawberries is a match made in heaven. I hear you, my problem was, that usually there aren’t many asparagus recipes one can find, and I was growing tired with eating it only steamed or grilled.